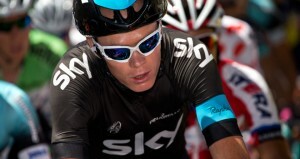 If you’ve been watching the Tour de France this year, you’ll have probably noticed one thing, Oakley Sunglasses. There’s no denying that Oakley’s advancements in technology, design and style keeps them ahead of the game when it comes to sport, and especially the Tour de France. This year sees the 100th Tour de France, and current leader Sky’s Chris Froome is looking strong whilst sporting the Oakley Racing Jacket sunglasses. Oakley have long been at the forefront of technology with their Sunglasses, but what makes them the choice of so many professional athletes? Durability is important, and Oakley’s lightweight, yet durable frame material lives up to this. The “O Matter” material used for their sport frames is very flexible and springy, yet resistent to stress and comfortable at the same time. The frame stems are then coated with “Unobtanium”, Oakley’s answer to conventional rubber grips. Oakley’s Unobtanium reacts with sweat, increasing friction, and therefore grip – another important characteristic of the perfect eyewear for sports. They also use Unobtanium on the nose bridge, again to increase grip. Vents added both in the frame, and the lenses, allow airflow and in turn assist with cooling. Oakley’s Three-Point fit ensures the frame stays in precise optical alignment, and without the usual pressure points that some sunglasses can exert. Lens technology is another of Oakley’s strong points and their High Definition Optics ensure clarity, and impact resistance like no other. This clarity is extended right to the edge of your peripheral vision with their Polaric Ellipsoid technology. The wrap around design of the Plutonite lenses provides an impressive lenses curvature that keeps all the elements at bay and of course blocks 100% of UVA/UVB and UVC rays and harmful blue light up to 400nm. Some of Oakley’s sport models feature SwitchLock technology which allows the wearer to change the lenses in a matter of seconds, yet at the same time ensures it’s 100% secure without distorting the natural curvature that’s required for a perfect view. If you’re looking for a pair of sunglasses for sports, you cannot go wrong with a pair of Oakleys. Take a look at the latest Oakley Tour de France special edition models to celebrate the 100th Tour de France. 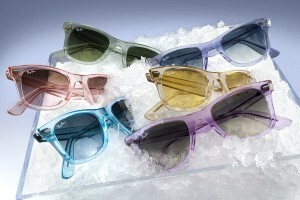 Just in time for Summer, Ray-Ban have unveiled their latest colours of the ever popular 2140 Wayfarer range. Inspired by the famous ice-pop, the new colours are bright and funky and with 6 flavours to choose from, there’s one for every taste. The colour co-ordinating lenses compliment the transparent frames, making them look almost good enough to eat! The Ray Ban 2140 Wayfarer Ice-Pop Sunglasses are available in Citrus, Strawberry, Watermelon, Grape, Mint and Blueberry flavours, the Citrus and Watermelon having polarised lenses. If you want a fresh, funky look this summer, take a look at the Ice-Pop flavours now.